This continuing medical education activity is provided by The Medical College of Wisconsin. This activity is supported by educational grants from Janssen Biotech, Inc., administered by Janssen Scientific Affairs, LLC; Spectrum Pharmaceuticals, Inc.; and Takeda Oncology. Multiple myeloma management has undergone profound changes in the past few decades, this is largely due to advances in understanding the disease biology and the development of new therapeutic options. However, this progress has also led to an increasingly complex treatment environment. 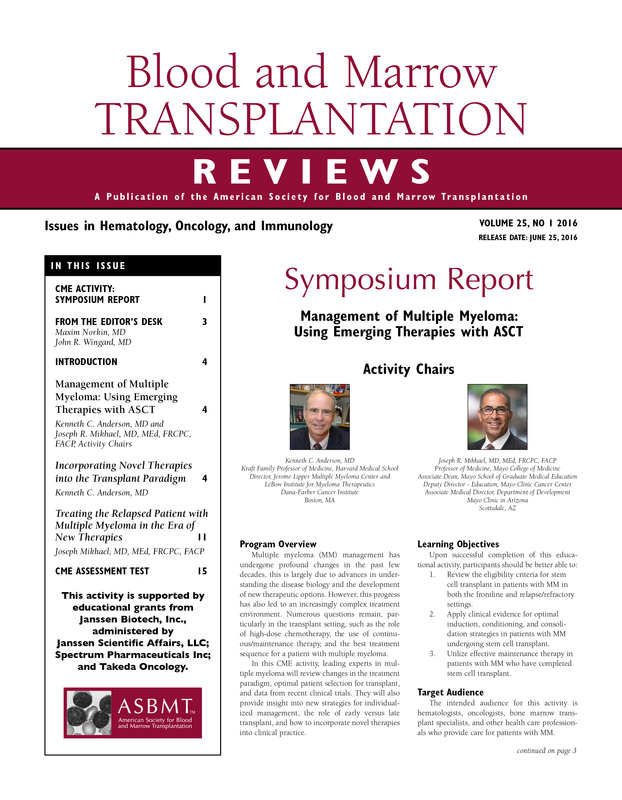 Numerous questions remain, particularly in the transplant setting, such as the role of high-dose chemotherapy, the use of continuous/maintenance therapy, and the best treatment sequence for a patient with multiple myeloma. 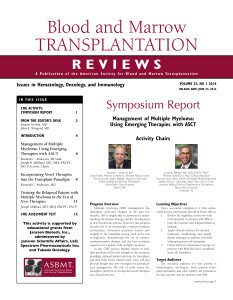 Review the eligibility criteria for stem cell transplant in patients with MM in both the frontline and relapse/refractory settings. Apply clinical evidence for optimal induction, conditioning, and consolidation strategies in patients with MM undergoing stem cell transplant. Utilize effective maintenance therapy in patients with MM who have completed stem cell transplant. The intended audience for this activity is hematologists, oncologists, bone marrow transplant specialists, and other health care professionals who provide care for patients with multiple myeloma (MM). This enduring material is approved for 1 year from the date of original release, June 1, 2016 to June 1, 2017. The employees of Vindico Medical Education have no financial relationships to disclose. Kenneth C. Anderson, MD, discloses that he has been on the Advisory Board for Celgene, Gilead, and Millennium. He also is a Scientific Founder for Acetylon, C4 Therapeutics, and OncoPep. Joseph R. Mikhael, MD, MEd, FRCPC, FACP, discloses that he has received Institutional Research Funding (Clinical Trials) from AbbVie, Celgene, Onyx, and Sanofi. Valerie Zimmerman, PhD, medical writer, has no relevant financial relationships to disclose. The material presented at or in any Medical College of Wisconsin,Vindico Medical Education, or Carden Jennnings Publishing Company, Ltd, continuing education activity does not necessarily reflect the views and opinions of Medical College of Wisconsin,Vindico Medical Education, or Carden Jennnings Publishing. Neither Medical College of Wisconsin,Vindico Medical Education, or Carden Jennnings Publishing, nor the faculty endorse or recommend any techniques, commercial products, or manufacturers. The faculty/authors may discuss the use of materials and/or products that have not yet been approved by the U.S. Food and Drug Administration. All readers and continuing education participants should verify all information before treating patients or utilizing any product.